When most people think of Playa del Carmen they think of the mega-resorts that line the Caribbean coast on either side of the city. However, there’s a whole other side to the city. Playa del Carmen is a city that’s easy to travel independently. We’ve been living in Playa del Carmen for almost a half a year using it as a base. We’ve put together this independent Playa del Carmen travel guide to help and show you that Playa is the best place in the Yucatan to travel independently. On your next trip to Playa del Carmen skip the big resort and see what Playa is all about. When traveling to Playa del Carmen you will fly into Cancun International Airport, which has many good and affordable options during the tourist season. When you arrive you will arrive in one of the three terminals. Most flights from the US and outside of Mexico will come into Terminal 3, and a few into Terminal two: Jet Blue, Air Canada, AirTran. Terminal 1 is primarily for domestic travel within Mexico. Personally, the best way to get to Playa del Carmen is by a private driver for only $60. It’s the easiest and quickest way to get your vacation started! Unless you are planning to do a lot of independent day trips from Playa del Carmen, then we would suggest renting a car. If you think renting a car in Mexico sounds scary make sure to read our Mexico car rental guide here, we’ve rented cars at the Cancun airport a dozen times we know the ins and outs. If you have a larger group a taxi or shuttle service can be just as affordable and more convenient than the bus. The shuttle service, Super Shuttle, is straightforward and easy, but more expensive if you are traveling as a couple or just one person. The shuttles start to make more sense when you are a group of 4 or more. You can book the Super Shuttle at the airport, no need to book in advance. The CHEAPEST place to book it is here online for $60 one way for up to three people or $110 for a roundtrip airport transfer to Playa del Carmen from the Cancun airport. When we don’t feel like taking the bus we book online here. Inside each terminal, after the security and customs area, there will be an ADO bus company booth to purchase tickets to Playa del Carmen. Buses run roughly every 20 minutes. You can pay in either local currency or US dollars. ADO uses nice coach buses with A/C (sometimes too much A/C) and will make one stop between the airport and Playa to drop people off in Puerto Morelos (2-3 minute stop). If you are coming from Terminal 2: Generally you will buy your ticket at the booth inside the airport. Once you leave the doors of the airport the bus platforms are further away and if it’s your first time you are better off asking for directions to the bus platforms. If you are coming from Terminal 3: You can sometimes purchase your ticket at the booth or other times they will instruct you to buy it outside next to the bus at the platform. Terminal 3 is very straightforward and the buses are located right outside the terminal. When you arrive in Playa del Carmen you will need to find a taxi to take you to your hotel in Playa del Carmen. The ADO bus station is on 5th Avenue (the main walking street) and Calle Juarez. If you don’t have much luggage it’s best to walk a block or so away from the bus station to get a taxi at a better rate. A taxi from the bus station to a central hotel should be 50-100 MXP depending on how many people you have and your negotiating skills. To go further or to Playacar, it will be more like 100-150 MXP. You can book a car online and pick it up at the airport. We find RentalCars.com generally has the best rates but check around. RentalCars.com you can cancel for free up to 48 hours before pickup. However, it will even out with the savings of not taking another transport to Playa del Carmen. Driving to Playa del Carmen from the airport is simple and there are not many roads and the route is well marked. * For more info on rental cars in Mexico and Playa del Carmen/Cancun see the rental car section of the guide here. First of all, most people in town will simply drop the ‘del Carmen’ from the name and just call it Playa for short. Playa is Cancun’s little brother that is smaller and more condensed. The main town runs right into the beach and everything is much closer together. Where Cancun you are far away from the main town in the hotel zone, in Playa del Carmen the town and beach are close. You can’t talk about visiting Playa without mentioning its most important tourist street, 5th Avenue. The Avenues run parallel to the beach and are numbered starting at one and then by 5’s (5th, 10th, 15th, 20th, etc). 5th Ave is filled with bars, restaurants, and tourists shops. It has been blocked off to cars and is strictly a walking street in the heart of the city. The Calles (or streets in English) run at 90° to the beach and are all even numbers from 2nd all the way up to 110th street. The main tourist area is from 2nd to 46th street, from the beach to the highway and also the whole of Playacar. The best way to give directions in Playa del Carmen is to use the streets and avenues. Once you come and visit Playa del Carmen you’ll understand. Playa del Carmen is a very safe city to visit. There is a big tourist police presence, not that anything bad will happen, but to keep things operating smoothly. We have spent several months living in Playa del Carmen and trust me the city is safe, there are probably worse neighborhoods in your own hometown. Even late at night, I don’t feel uncomfortable walking around on the streets. Like anywhere if you look for trouble, I’m sure you could find it, but if you are just visiting Playa del Carmen you’ll be more than safe. Playa del Carmen is a very walkable city and most people find it easy to navigate. For longer distances or in the heat of mid-afternoon you may want a taxi to take you around. The fares within Playa Centro are supposed to be fixed prices at 30MXP for a ride, but tourists often get taken advantage of a pay higher rates. If you can speak any Spanish to give directions the chances are better of getting the correct rates. Rides to outlying resorts $120-200MXP – There is a rate sheet most cabs with many resorts listed that drivers do follow, ask to see the sheet if going to a far away resort from Playa del Carmen. There are many bike rental agents in Playa del Carmen, the going rate for a bike rental in Playa is about $15 per day. You can buy a lot of cabs and almost always rent a car for less money per day than a bike (crazy I know). A bike may sound like a fun way to see the city, but unless you are comfortable on a bike and really want some exercise I would skip it. Playa del Carmen is not a very bike friendly city if you don’t know it well, plus there isn’t that much to see off of the beach. Additionally, bike theft is rampant in the city, if you do rent a bike make sure they give you a strong lock, a bike chain will be cut and the bike will be stolen. Renting a car for a day or a few days is one of the best ways to see all the great things the Yucatan has to offer. Car rentals in Playa del Carmen are usually very cheap. We have rented cars several times and often pay just $5 per day plus insurance. Most U.S. based car insurance that you have at home will not cover you in Mexico, but it’s best to check. Legally you are not required to carry any insurance on a rental car in Mexico. However, if you opt not to take insurance there is a large hold put on your credit card in case of an accident (around $2500 USD). This reduces when you purchase additional insurance. Driving in the Yucatan outside the cities, the roads are not crowded, well marked, and generally in good condition. We’ve booked several times with Rentalcars.com with car rental stores in Playa del Carmen all located on 5th Ave. Yucatan has to offer. Car rentals in Playa del Carmen are usually very cheap. We have rented cars several times and often pay just $5 per day plus insurance. Most U.S. based car insurance that you have at home will not cover you in Mexico, but it’s best to check. Legally you are not required to carry any insurance on a rental car in Mexico. Preferred Rental Company: Book on RentalCars.com and compare companies for the best rates and they have a free cancelation. It’s best to book several months in advance to get the lowest price. This happens to more than just tourists, but you need to watch very carefully at the gas station. All gas stations are full service, meaning someone else is filling your car with gas. There have been many reports of attendants not resetting the machines between cars and charging you for your gas and the person before you Also, be very careful giving them the correct money and receiving the right change. It’s best to have exact change or simply ask them to fill a certain amount of peso of gas. Insider tip: Avoid the toll road 180D. The tolls to use this road are high for how much time you save traveling on it. Unless you are short on time I would avoid this road. One of the biggest choices you have to make when considering where to stay in Playa del Carmen is whether you want to be in Playacar or in Playa Centro. Both are nice places to stay in Playa del Carmen, but Playacar will be quiet and secluded while Playa Centro you will be more in the middle of the action. Airbnb -One of the best options is Airbnb there are 300+ Playa del Carmen apartments listed. Rooms for only $15 a night to gorgeous beachfront properties for the family for $1,000+ a night. Luxury Airbnb condos are fractions of the price of Playa del Carmen hotels. Airbnb first-timers, if you sign up through my referral link you get $40 credit when you book your first trip! –>> sign up here! New guesthouses are being added constantly. Bric Rentals – If you want the luxury of a resort but with more independence then check out the Playa del Carmen vacation rentals that Bric has to offer. They have some amazing places all around the city to suit every style. Recently we stayed with them in their Elements building near 46th street right on the beach. We had a two bedroom place overlooking the ocean and a massive pool. The Elements is a condo complex with a mix of vacation and owner-occupied condos right on the water here in Playa. The rooms were stylish and very comfortable. We had a mix of indoor and outdoor space with a large patio and a rooftop deck with a hot tub. El Fogon – Usually in the top of restaurants on TripAdvisor and it’s the first place we bring guests when they visit us in Playa del Carmen. We have even had Mexican friends in town visiting give this place their approval for legit tacos. I haven’t had a bad thing on the menu, and I’ve had most of it. The thing most tourists don’t know is that there are actually 3 of these restaurants in Playa del Carmen. Most people know of the El Fogon on Avenue Constituyentes and 30th and it will almost always have a long line after 7 pm. Visitors to Playa del Carmen don’t know that there are two more locations they could walk to before moving up one spot in line. Location #3 Ave 30 Norte between 30 & 32. Nativo Restaurants – Another go-to place we always bring people is Nativo. They serve food at all times of the day, but we usually go here for breakfast and their really good fruit smoothies. There are several locations around Playa del Carmen. A liter fresh fruit smoothie varies between 35-45 pesos and they are definitely filling. Please remember to tip waiters, for suggested tips read our tipping in Mexico guide. Chesters – When craving some good pasta or even pad Thai we head to Chesters. A little way away from the tourist path, but still in Playa Centro. All their pasta dishes are served in skillets and more than enough for 2 people to share. They don’t serve alcohol, but they have tasty smoothies. Most pasta dishes are 140-180 pesos. Map: Click here Av.40 between 4Nte and Calle 4 Bis. Don Chendu – Chicago style deep dish pizza in Playa del Carmen. We’re from Wisconsin and would drive to Chicago just to get good pizza, and we can tell you Don Chendu pizza in Playa del Carmen is the real thing. One pizza is big enough for two people to share, and they also have affordable house wines 45-65 pesos. There are three main areas where you can find street carts selling all kinds of local eats. You’ll almost always find someone selling Al Pastor tacos along with tortas, empanadas, tamales, and other tasty things. Always find one that is busy with locals to make sure the food is good, and the street food is safe! The Yucatan was once the home of the Mayan empire and ruins can be found all over this part of the world. Several of the Mayan sites make great day trips from Playa del Carmen. The most famous of all of Mexico’s Mayan Ruins is the Chichen Itza site. Now considered one of the 7 wonders of the New World, Chichen Itza’s highly symmetrical main pyramid is worth the trip. This site, for good reason, gets busy every day. Beat the crowds and the heat and get there early. Coba sees fewer tourists than Chichen Itza and Tulum ruins, and you can actually still climb some of the structures. Coba is way less crowded and makes for a great day trip from Playa del Carmen as it’s a lot than Chichen Itza, but you can easily do a day trip that hits all of the Mayan ruins in one day. Perched high on the cliffs above the Caribbean sea, the Tulum ruins are some of the most picturesque. Although the ruins themselves may not be as impressive as other, the aqua waters and the white sand beaches below make up for it. The ruins at Tulum will have the most tourists out all the Mayan ruins due to its location. Tulum ruins are the 3rd most visited site in all of Mexico and the most visited site in the Yucatan. We’d suggest going right away in the morning not only to beat the crowds but the heat. About 45 minutes south of Playa del Carmen is Akumal bay which is home to a healthy Leatherback sea turtle population. It’s just about guaranteed if you snorkel here, you will see turtles. Every time I go I see turtles within the first few minutes of swimming. How to get there: You can drive yourself here if you have a rental car parking is 50MXP and it’s a short walk from the parking lot to the beach. Public Transportation: There is also public transportation to reach Akumal bay and swimming with the turtles. Head to the collective taxi stands on Calle 2 between 15th and 20th Avenues and find the ‘collectivo’ vans heading to Tulum. You will have to wait for them to fill up, but it only will take a few minutes. You can tell the driver you want to get out at Akumal and they will stop there for you, $35MXP each way per person. After you exit the collective taxi walk on the walking bridge over the highway toward the beach. A short walk leads you to the parking lots and stores, from there follow the signs and others heading to the beach at Akumal. Catch the same vans back. This time on the beach side of the highway. Look for a Taxi with “Playa Centro” sign in the front window, that’s the one you need. The taxi will drop you off in the same place you started from. As beautiful as the beaches are in Playa del Carmen, the beaches in Tulum are even nicer and less crowded. A trip down the coast to Tulum makes for a great day trip from Playa del Carmen. Finish the day and watch the sunset at one of our favorite beach bars which is actually a tree house high in the air above the beach at Mateo’s Restaurant (Map to Mateo’s). A cenote is a natural sinkhole that is a result of collapsed limestone that has exposed underwater rivers. There are an estimated 7,000 cenotes in Mexico. The best-known cenotes are large swimming pools. The water in cenotes is super clear and not only great for swimmers but divers as well. Many cenotes have underwater cave systems for divers to explore, Cenote Calavera is great for divers. Here are our favorite cenotes nearby Playa del Carmen. This cenote is famous for its long swim through that connect to other parts of the massive cave system. The name Cenote Dos Ojos translates to “Two Eyes Cenote” which is likely because it is two sinkholes each 70 meters in diameter connected with a 400-meter passageway. Dos Ojos has the deepest known underwater cave passage at 118 meters in depth making it a great spot for divers but also a great spot for snorkelers as well. El Pit Cenote is one of the best cenotes for diving. One of the most beautiful cathedrals open top caves is Ik Kil just a few minutes away from Chichen Itza. These two pairs great together as a day trip, but many people do this, so an early start will help you avoid massive crowds in the afternoons. There is also a 20’ platform to jump into the pool here as well. Only 20 minutes from Playa del Carmen is Jardin del Eden cenote, which translates in English to “the garden of Eden.” This cenote is different than most cenotes as it is open and has a lush green surrounding area, super clear water, and a 12-foot jump for cliff jumping (great for snorkelers). This pretty little Spanish colonial town makes a great stop on the way to Coba. Valladolid is a nice place to stretch your legs and get a bite to eat. Park the car in the Plaza Francisco Canton and just wander around the surrounding streets. 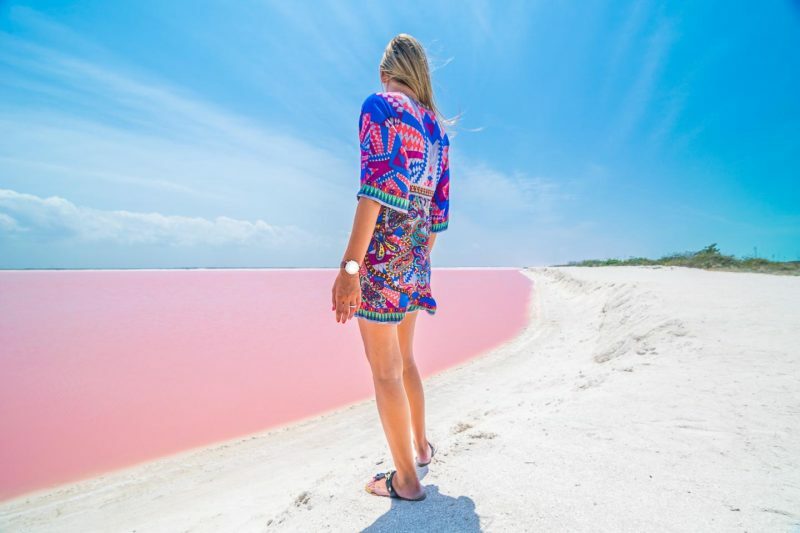 If you like road trips, the 3-hour drive from Playa del Carmen to Los Coloradas is for you. This gorgeous drive on desolate highways will end at empty beaches, sand dunes, a pink lake, and flamingoes (November-April). Playa del Carmen is one of the best places to reach the island of Cozumel. About 15km from the shores of Cozumel island. It’s best to rent a car in Cozumel, the island is small but big enough you’ll want a car for the day. Insider tip: Buy only a one-way ticket so you can choose when you want to return to Playa del Carmen. Also, don’t buy tickets from anyone on the street, buy them at the ferry terminal. Only 25 minutes south of Cancun is Xpu Ha Beach, which if you ask us is the next Tulum. 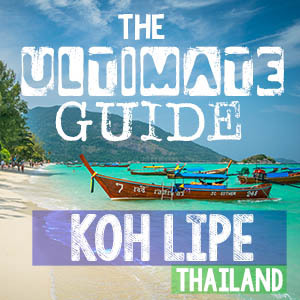 There is a gorgeous white sandy beach, chill restaurants & bars, fun, and cheap beach bars. It’s a great place to spend the day if the beaches in Playa del Carmen are too packed. Insider Tip: Avoid the weekends, the beach is twice as busy due to locals off on the weekend. If you do come on the weekends get here before 1130 a.m. The entire length of Playa Central and Playacar is a nice white sand beach with aqua blue water, but there are some spots that are better than others. Several spots on the beach are quite rocky, other parts the beach is eroding, and some parts are places for boat docking. The best piece of beach in Playa Centro is from the large pier on Constituyentes street north to 46th street. This is a nice long section of beach with lots of beach clubs and the beach is generally clean and well taken care of. From the pier south to the other pier there are many problems with the beach eroding and it is not nearly as pretty as the other side. North of 46th street the beach comes to a rocky end with a restaurant on the end. On the south side of the large pier on 2nd (Cozumel Pier) this is where Playacar starts and the beaches in this area of town are nice deep beaches and are generally clean and quiet. If you are staying off the beach you can still enjoy the beach from a lounge chair with a drink in hand. Mamita’s – One of the largest and most fun beach clubs is the ever popular Mamita’s. Most days there is a DJ playing music and it’s known for its fun party atmosphere. Mamita’s is also host to a few major music festivals, including the massive BMP electronic music festival held every January. Coralina – In front of the Grand Hyatt on the beach near 24th street. Coralina is a new beach club with red umbrellas. The drink prices are similar to other places on the beach. We like it because it’s located just behind a nice piece of sand in a very central spot in the town. More and more hotels and bars in Playa are opening rooftop clubs for the daytime. Several places around the city offer free use of the rooftop pool when having food or drink. Some have minimum daily spending in order to use the pool and to be at the club. Be Roof – Located at the Be Playa hotel just take the elevator to the roof. Free entrance and use of the pool and lounges with the purchase of food/drink, no minimum. The Palms – Located in The Palm At Playa hotel $500MXP minimum consumption per person to use facilities.